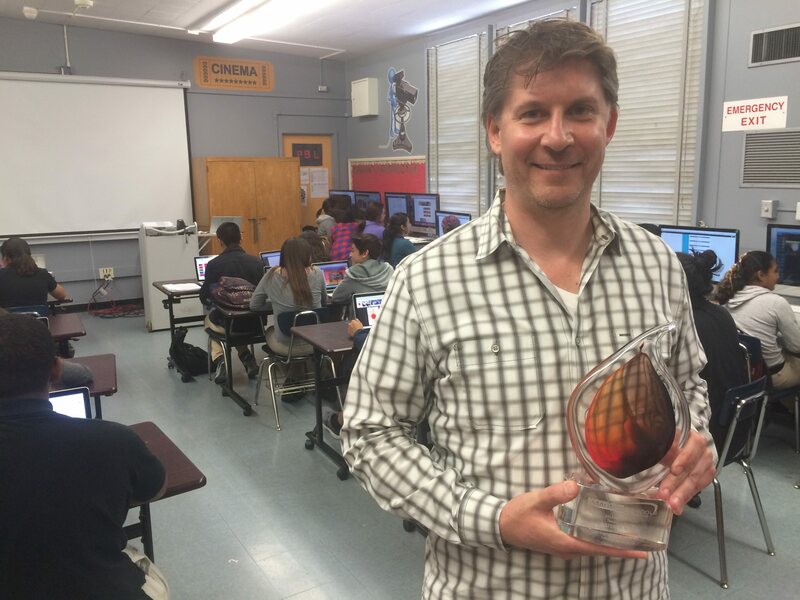 Three years ago, the school now known as the LAUSD/USC Cinematic Arts and Engineering Magnet converted from a performing arts magnet into one with a cinematic focus, and it hired Matt Waynee to head up the new cinematic arts department. To add to his success at the school, Waynee has now been named National Magnet School Teacher of the Year by Magnet Schools of America. “It’s amazing. I’ve been teaching a long time and it is an honor. I tell my students that I could not have won it without them because I get to brag about them and all the amazing projects they are doing,” Waynee said. Waynee worked in Hollywood for a dozen years and earned a list of screenwriting and producing credits before coming to the school. He previously worked as a teacher for three years in Texas after graduating from Notre Dame and signing up with Teach For America. Upon moving to Hollywood he earned a master’s degree from USC while substitute teaching before taking the full-time job at LAUSD/USC Cinematic Arts and Engineering Magnet. The magnet school is a small one for the district, with 660 students in grades 6-12, and Waynee said one advantage of the size is being able to more closely follow all of his students. “Being a smaller magnet, we really are a family and you know early on how a student is doing, if they are failing a class or need extra help,” he said. The funding for the school’s conversion to cinematic arts was part of a three-year, $10.4 million federal Magnet School Assistance Program grant shared with four other schools. The grant has allowed the school to purchase professional-grade film and audio equipment, along with computers and editing software, allowing Waynee’s students to learn college-level skills. The grant runs out this year, so Waynee said fundraising will be needed to keep the school’s cinematic arts program operating. He already authored a grant that netted $30,000 for the school and will be working on more over the summer. Waynee teaches his students a wide variety of multimedia skills in a number of courses, including film, video, editing, Photoshop and graphic design. One key technique Waynee said he uses to inspire his students is to attach real world experience to his assignments. He often has his students enter outside contests, and some of them have produced stories that have appeared on KCRW and in the Los Angeles Times and other media outlets. Jessica Munoz, a junior, had an audio story appear on KCRW that she produced in one of Waynee’s classes. “Mr. Waynee really — as opposed to other teachers — he does short lectures and then lets you be as creative as you want with it. It is more of a suggestion and that you have the power and he lets you explore your creativity,” Munoz said. Waynee said when students like Munoz get their projects out in the world it can inspire them much more than any lecture or homework assignment can. “I feel that if they are challenged and see that, ‘Oh, what I am doing has a chance to be seen and get out there,’ they challenge themselves a little more and find what they feared before they maybe get over,” Waynee said. Several of his students said one of Waynee’s best attributes is his availability, as he is often at his desk during lunch and after school for students who need extra help.